A striking pub externally, and an interesting one internally. Virtually empty on my early Saturday afternoon visit, though going by the décor & remarks of previous reviewers it is plainly a night venue. Friendly enough though, and a pint of Spitting Feathers (3.40, not seen before or since) was more than satisfactory. 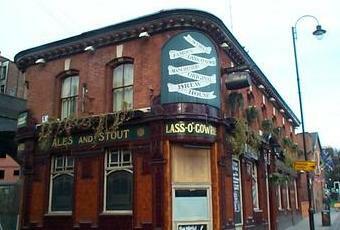 Called in for a swift pint last night while in Manchester. Mid-week so was not packed out but a fair few students in and an older gent (plus me) and a live band on. At the bar there are 8 pumps, of which 2 were off. Available were Winter Tweed by Tweed Brewing Company (4.1%), 4T's IPA, Spitting Feathers Special Ale, and 3 from the Greene King stable. I went for the Winter Tweed which was quite a pleasant bitter, not as bland as some bitters. Can't remember how much it set me back but don't remember being shocked at how little change I was given. The live acts weren't uncomfortably loud and the atmosphere was OK.
First time in following its refurbishment. The bar area now looks much more modern, whether that is a good or a bad thing is down to personal taste though. There were plenty of people congregating in front of the bar which made it a bit congested - strange as there were plenty of seats available further down the pub. After making it to the bar there were about 5 real ales available, one of which was Greene King IPA Reserve, which I have never had before, but decided to pass on this time in favour of one of the festive ales. 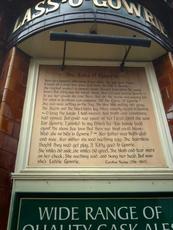 All in all, still a pleasant pub with a fair selection of ale. Perhaps some of the character has been lost though. Top class pub. Classic tiled exterior gives the pub a distinctive iconic look. Interior has a timeless feel, especially the snug. Tried two beers from Allgates (brewed at Wigan) both of which were excellent: 'Dry Bones' which was light & tasty and 'Hung Drawn & Portered' which was dark and delicious. Fantastic place. 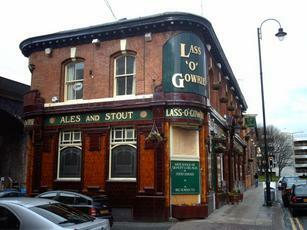 The Lass O'Gowrie on Charles Street was voted Best Pub in Britain in 2012 in the Great British Pub Awards. Pub bosses admit they have seen takings tumble since the closure of the BBC's Oxford Road site - but say their pleas for a rent reduction to owners Greene King fell on deaf ears. After a two-year battle with the brewery chain, landlord Gareth Kavanagh will step down from running the pub this weekend - and all ten employees will be made redundant. Mr Kavanagh, 41, who took over the pub eight years ago, finally won a battle to reduce his £54,000-a-year rent in August after going to an independent tribunal. But he told the M.E.N that it came too late to save the pub - and said the nail in the coffin came when the brewery demanded a further £40,000 refurbishment of the venue take place. Mr Kavanagh claimed that the brewery managers had labelled his award-winning business 'below-average' and said he should be taking £500,000 a year. He told the M.E.N: "Businesses around us have been closing down left, right and centre. Because we weren't getting passing trade, we had been working on a business plan to become a destination pub. "But the people who run the brewery don't care that we're an award winning pub. They just look at our location and said we were a 'below average pub' and in their opinion we should be making 30 per cent more revenue." The businessman said he requested a rent review in 2011 after his turnover dropped by 40 per cent after the BBC relocated from Oxford Road to MediaCityUK in Salford and other local businesses closed down. When the brewery did not grant the request - the pub boss went to an independent body which ruled the rent was too high and should be slashed by 40 per cent. But Mr Kavanagh claimed he was forced to quit when brewery bosses mounted a full-scale 'depreciation' review of the pub and demanded that thousands of pounds worth of renovation take place. He added: "We passed our fire safety tests with flying colours, but despite this Greene King carried out a full scale review of the pub after they lost the case. "Nothing can be done about it now. We've wanted to keep our own counsel about the problems, even after we won the review. But now we just want to thank everyone who has made the pub a success. I'm out of a job now and have lost a lot of money but I really hope all our talented, fantastic staff get work very soon." The traditional pub boasts an eclectic mix of theatre and comedy, vintage video games,and live music. It has also been at the heart of the Greater Manchester Fringe festival, organised and co-founded by Mr Kavanagh and manager Lisa Connor. Quirky shows to feature at the pub include a play based on the life of Joy Division's Ian Curtis and a festival celebrating 50 years of Doctor Who. It is understood that Greene King will seek a new licensee for the pub after Mr Kavanagh leaves on January 6. The annual Great British Pub Awards are given by the licensing trade publication, The Publican's Morning Advertiser. A Greene King spokesperson said: “We are investing in the Lass O’Gowrie with a major redevelopment to improve this popular ale-house. The pub will remain independently run and the new tenant, a successful local pub operator, will take over shortly.